"The salon/spa has a nice layout and decor. It looks small at first, but behind the main counter opens a nicely decorated room with back-to-back rows of massage chairs for pedicures. 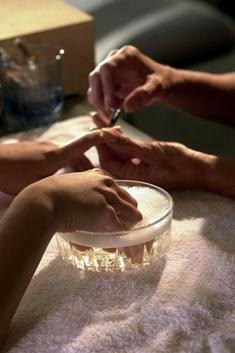 There are several manicure tables, a waxing room with a comfy bed/table to lay on as well as two hair cutting stations. Holly cut my hair and did a good job. I told her I wanted to add layers with a trim. She did exactly that and suggested I cut bangs. I usually don't get bangs because I don't know what to do with them, but Holly walked me through a few options and I love them! Pricing is very fair even without the 20% grand opening discount. 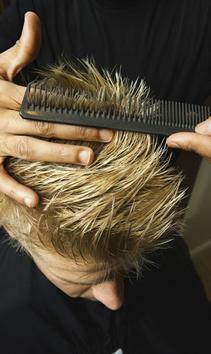 I got a shampoo, haircut, styling, and eyebrow wax for a little over $27." -Halani X. "I just visited Palladio Day Spa recently and loved the stylish entrance area. The decor is lovely and very clean. One of the reasons I like this salon is the fact that they do not have the "whirlpool foot baths" which have been known to breed germs and fungus. These baths are very difficult to sanitize, and fungus can grow inside the drain. Palladio has very nice massage chairs with a simple foot bath/tub. This allows me the peace of mind of a clean and safe experience." -Carrie P.
Prepare to treat yourself to a REVITALIZING spa experience! We offer a variety of packages for all occasions from gift certificates to large party accommodations. Our Professional Staff are eager to accommodate Bridal parties, birthday parties, corporate affairs & other special occasions, as well as walk-in customers. Enjoy five-star quality at a fraction of the price! Include Palladio Day Spa in your weekly "Wellness" agenda!